The number of Alabama medical assisting jobs is increasing fast. Between 2012 and 2022, Projections Central reports there will be a robust 27.2 percent increase in the number of medical assistants in the state. This is because medical assistants provide strong and much-needed support to doctors, from providing hands-on medical care to patients, to performing administrative and billing tasks in the office. 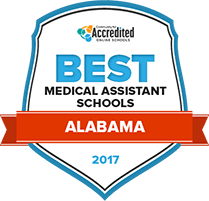 Alabama has several accredited programs to meet the demand for well trained, knowledgeable medical assistants. For more information about the training required to become a medical assistant in Alabama, salaries, certifications offered and schools available, read on. Earning a degree in medical assisting in Alabama is a good way to grow your career opportunities. Graduates of these programs go on to work in physician offices, helping to cut back on wait time for patients and easing the caseload for physicians by taking on routine visits. To help you find the perfect program to meet your needs, we've done the research to bring you our list of the 2017 Best Schools for Medical Assisting. Trenholm State Community College offers a medical assisting technology program that may act as a stepping stone to achieving a career as a medical assistant in a variety of medical settings. Students will work through a curriculum designed to outline the administrative duties performed by medical assistants, while also developing a well-rounded base of knowledge with general education courses. Along with accepting transferable credit from other institutions of higher education, Trenholm also offers its own credits that can be transferred out, allowing students to utilize all previously earned credits. Eligible students may be interested in applying for financial aid coverage with Trenholm. At Wallace Community College in Dothan, students may pursue an associate of applied science degree in medical assisting to put them on the right path to achieving a career as an assistant in a medical office. The medical assisting degree can be completed in just two short years, and provides students with all necessary knowledge to be successful in their field. WCC offers a wide variety of degrees that can lead to either immediate job placement after graduation, or to transferring into a four-year school to continue learning in a bachelor’s program. Students who are interested in beginning a career as a medical assistant may wish to consider pursuing an associate of applied science degree with an emphasis in medical assisting with Chattahoochee Valley Community College. This program is designed to prepare students for the administrative and clinical duties required of medical assistants. CVCC blends a combination of traditional theoretical learning in the classroom with hands-on learning scenarios to maximize student success. Students attending CVCC may spend their free time cheering on their school sports teams, which include baseball, basketball, and softball. A variety of student clubs and organizations are available for enrollment, as well. Northeast Alabama Community College offers a wide variety of degree programs for students to select from, including an associate of applied science program with an emphasis in medical assisting. Students pursuing this degree may also complete one or more short-term medical certificates—including phlebotomy and medical transcription—to further specialize their learning. NACC’s primary goal is student success, which is why they provide all students with a large selection of student services to help maintain academic success. Students may also complete some of their learning in an online format, if traditional in-class sessions aren't a schedule-compatible option. In just two years, students can earn an associate of applied science in medical assisting from Wallace State Community College in Hanceville. This program—as is the case with all Wallace State programs—students will progress through a comprehensive curriculum administered by experienced faculty members with several years of applied job experience under their belt. Wallace blends theoretical learning with hands-on learning tactics to allow students to fully develop their knowledge of their respective programs. Most credits offered at Wallace State are fully transferrable, allowing students to continue their learning at a different institution of higher education if the need arises. J.F. Drake State Community and Technical College offers an associate in applied technology degree with an emphasis in medical assisting to prepare students for starting a career on the administrative side of the medical business. Students will take courses designed to develop their understanding of medical scheduling, billing, and coding. Courses at Drake State are offered in a variety of formats, ranging from traditional in-class sections to online learning, evening courses, and even late-start courses. Learning at Drake State is an affordable option for students interested in earning a college degree, but are worried about paying heavy tuition prices. Financial aid coverage is also available for any eligible student. An associate of applied science degree in medical assisting earned at Northwest-Shoals Community College can put students on the right path to achieving a career as a medical assistant in a variety of medical-based environments. In addition to the full two-year program, students may also complete short-term medical certificates, including emphases in phlebotomy and medical bill and coding. Students may transfer NWSCC credits to a large number of institutions of higher education, allowing students to prevent backtracking in their academic program. Students who feel their schedules are too busy for on-campus learning may benefit from NWSCC’s online courses, providing students with access to their coursework from any location. Special training is required to become a medical assistant. Medical assisting programs in Alabama offer either a diploma or associate's degree. These schools can be found all over the state. To figure out which school will meet your needs, take a look at the following search tool. How does Alabama define "medical assistant"? Alabama does not require certification in order to work as a medical assistant. However, certification can be obtained through medical assistant programs in the state, and it is highly recommended as a way to improve the potential for hiring and advancement. Assuming a medical assistant is certified, most certifications have continuing education requirements and require recertification every few years. Are there tasks outside the scope of medical assistants in Alabama? Administering certain medications, such as certain types of prescription drugs. What can Alabama medical assistants expect to make compared to the national average? The chart below answers that question. Depending on where a medical assistant decides to work within the state, compensation may vary. But by how much? The following chart offers insight into which areas pay more, on average, or less. The need for medical assistants is expected to rise dramatically across the country in the coming years, and Alabama is no exception. The chart below details the expected need for medical assistants in Alabama. Students seeking an associate's degree in medical assisting may find Wallace State Community College a good option. Learn more about what this college can offer aspiring medical assistants in Alabama. Wallace State Community College offers an associate's degree in medical assisting that consists of 71 credits. Upon completion of the program, graduates will be ready to sit for the Certified Medical Assistant certification exam administered by the American Association of Medical Assistants. The associate in applied science degree in medical assisting can be earned in as little as two years, or longer if the student chooses to attend part-time or does not enter with any general education requirements already completed. Includes the entire Administrative Code for regulated medical procedures and practitioners in Alabama. Even though Alabama does not have explicit rules governing the scope of what a medical assistant can or cannot do, the Alabama Board of Nursing website contains information about tasks a nurse can delegate to an unlicensed medical professional, such as a medical assistant. Learn more about medical assisting earnings in Alabama. In addition to providing for the Certified Medical Assistant (CMA) certification, the AAMA has local state chapters and provides information on what it means to become certified. The AMT offers the Registered Medical Assistant (RMA) certification, one of the most widely recognized medical assisting certifications.